Last weekend Kongo visited Scripps Pier in La Jolla, California. The last time he was there was a year or so ago but he has a new camera now and was itching to get another shot of the perspective from beneath the pier that makes it look like it stretches out toward infinity. There were about two dozen other monkeys who had the same idea so there was quite a bit of jockeying for position but photographers are generally friendly folks and everybody took turns. Mostly. There were some iPhone walkers who tended to wander cluelessly in front of the tripod gaggle, stop, check their messages, and then start snapping away. They usually didn’t realize they were ruining lots of long exposure shots until they turned around, put their back to the ocean, and started taking their obligatory selfie shots. Then their mouths make these surprised little Os and they get out of the way. Being a Saturday, there were also a fair amount of lovers wading through the low tide in wedding dresses trailed by obliging bridesmaids and best men. And there were the less formal engagement pictures. Kongo wished his camera was ready when one doe-eyed couple got caught by an unexpected wave. And there were a couple of family groups who dragged down little Christmas trees complete with ornaments to stage beneath the pier to make that perfect Southern California Christmas card or maybe it was just a Christmas Facebook greeting because not that many people seem to send Christmas cards by snail mail anymore. Kongo made these HDR images with a wide-angle 16-35mm lens, about five stops worth of Cokin filters, at fifteen second exposures. Each final shot consisted of three images taken at correct exposure, two stops up, and two stops down. Then they were merged together back home on the computer. Naturally, you need a sturdy tripod for these types of images and Kongo recommends a carbon fiber rig that is lighter than a Christmas tree when you’re lugging in across thick sandy beaches. Scripps Pier is at the foot of the Scripps Institute in La Jolla. 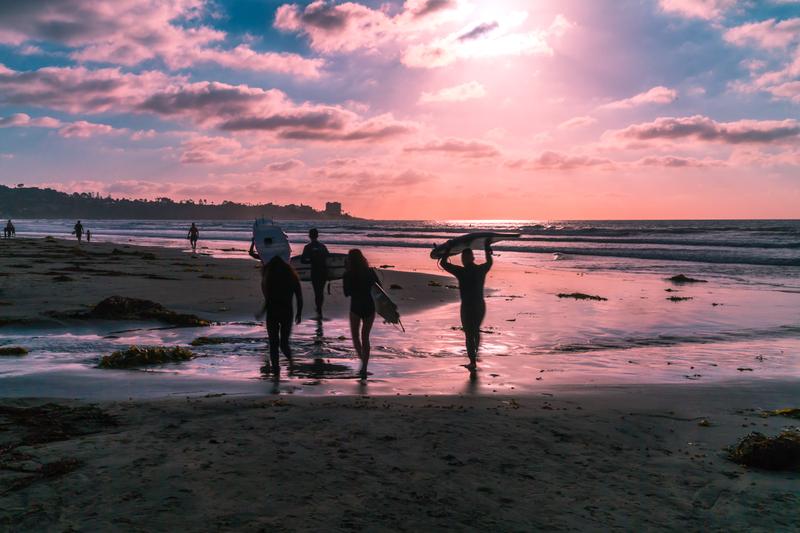 The easiest way to get there is to park in the free public lot at La Jolla Shores beach and hike about half a mile north. Just be advised that if you’re really, really a beach walker and you’re hankering for that special “long walk on the beach” that as you continue past the pier heading north you will soon come to Black’s Beach, San Diego’s famous clothing optional bit of shoreline. Those sporting cameras and tripods on this section of sand are frowned upon. So, you better even keep your iPhone in your pocket. That is if you have pants or anything else on or even have a pocket. 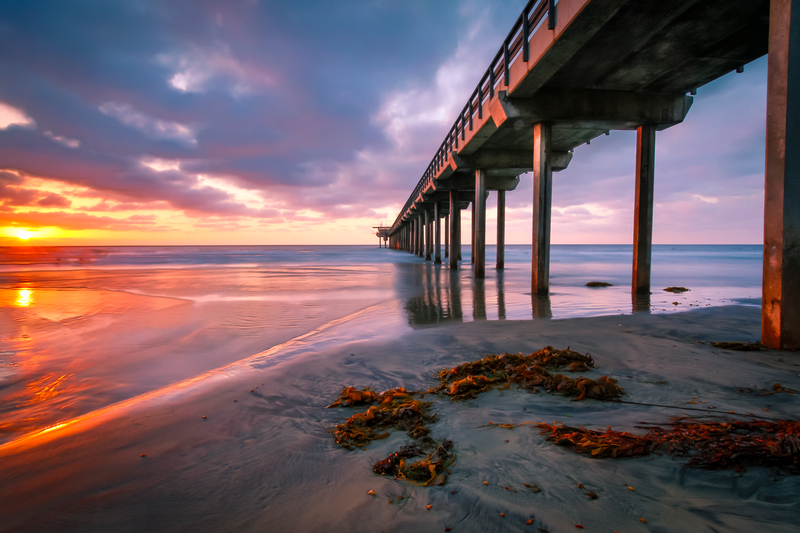 The pier is not open to the public as it is used for research by the Scripps Institute of Oceanography. It’s one of the longest piers in the world at over 1000 feet long. No problem with going beneath it. 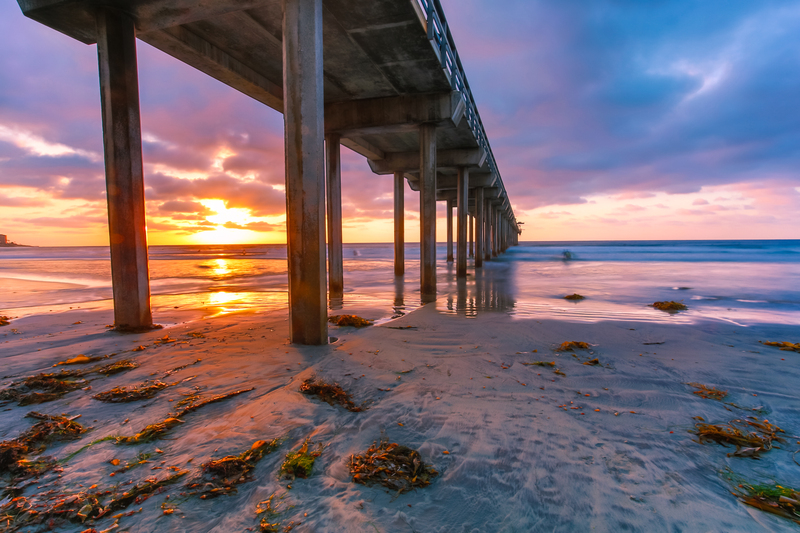 Another great pier in San Diego is the one on Mission Beach. At the end of the pier there is a little burger and sandwich shack and you can lean over the railing, feed the gulls, and watch surfers riding the waves just below you. The beach, by the way, is rated one of the best in California and several TV shows do filming here. Maybe you can be an extra sometime. Try visiting the next time you are in America’s Finest City. These are really nice images. I especially liked the third one, with the sunrise illuminating the decking and the well-composed seaweed(?) in the foreground. Thanks, Robin. Yup, that’s sea weed. There’s a large kelp bed offshore of this beach. 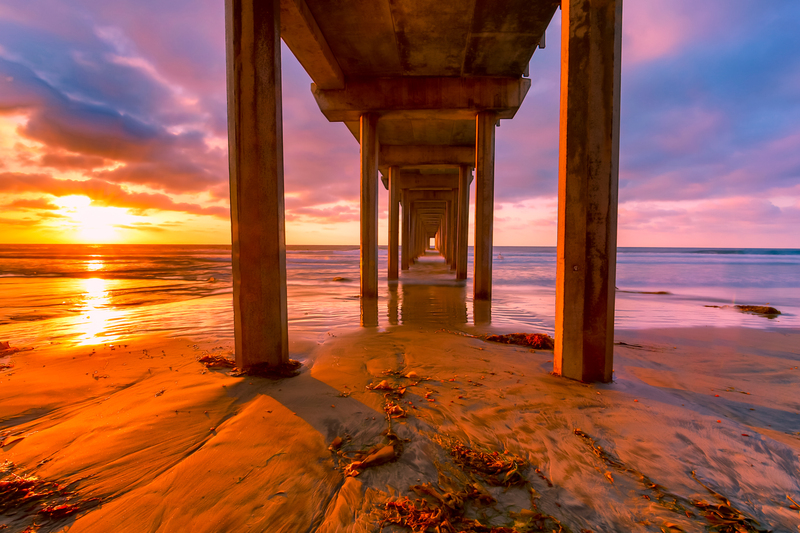 I, too, love piers and am itching to find some and take some long exposure shots…. Kongo got some great images here! It’s a great way to spend an evening! Why, thank you so much, Alex! These are great pictures – your technique is superb! Dreamy! The first picture is amazing!!! Thanks, Jenny! It was a fun shoot.